What do you want us to look at your board? => Well, I want everything in general look at me I do not know the what is right and what is wrong. Ah, let's see what to say about the Designs. Well to begin with, the Logo (Banner) is amazing, but don't you think it should be a little bit bigger? Since the logo, let's the users know what forum is really about. Next, the navigation bar is amazing! I love the buttons and the way you have them place. I love the banners, how they announce the news. Very nice. The theme is amazing, I love the background, how it's different colors. I love the Structure of the forum, it's very organized. For example, how you only have the important widgets showing. I love how you tweaked the forum with coding, for example, how you placed the url of the forum, below the who is online on, www.fmcodes.com? Another great think I like is how you placed a box behind the Groups in the legend. Looks nice and sleek. Nice, images for each forum, as well as the image you have for the who's online, in the footer (as well other images you have in the footer). The activity, seems to be okay. In most of the forums, there's new post or new threads this passed days (week). One thing, your member's don't really post. There's some members that only have +20 posts. So, the rest have -20. Not so great. Try to encourage them, by creating a Off-topic forum, or something that will catch their attention. But I do got to Admit there is a lot of members logged in the past 48 hours. The Staff are quite active! Nice. But I do suggest to remove some, you have too many, keep the ones that really are good for the job. As i enter to your forum, I was redirected to your portal, After a quick glance on to your portal there are 3 words comes to my mind, these are Professional,Detailed, and well organized. I love the blog on your portal where i can switch some feeds about your community. As i now enter to your index of your forum, I'm was very impressed i can see the smoothness and professional of your forum, The forum widgets are properly position as well. As my overall rating for this criteria it would be excellent. I'll start first with the major graphics such as banners and navigation bars, The banner's design is simple but neat, The navigation bars are quite unique, i must say that of all forumotion forum your navigation bars are one of the unique, Also i love the icons added to the navigation due to that guest can clearly understand, Since those icons represents what will happen if they click the link. Now for the forum content & organization, first I must say that you had great amount and set of forums for your forum content, there are a lot of discussion about forums and coding. You even have a "Forum Interview Section" where you interview a forum. As of now i would rate for this criteria, will be excellent. 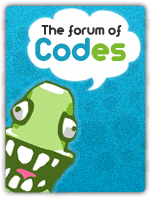 For the theme used on your forum, i'll say that you pick the correct theme, because for coding forums it would be nice if the theme is light,smooth, and neat. As i looked at the "Members connected during last 48 hours" i would say your forum is quite active, as it was before. Here's a suggestion to make your forum even active, I saw on the profile fields of your member have Store Points, You should a open it pronto and have some promos such as discounts,freebies etc.. on your grand opening, On that way members will become interested and might make them even more active. And also don't forget to tell your members and staff to spread out your forum link. 3 Admins,3 Managers, 3 Support mod, 2 designers, the amount of your staff is currently good. However there is one staff group named "Technicians" and it says on your Group description: "The best administrators of forums and best graphic designers. These members won contests and they are the best of Forumotion." I think it should renamed as "Winners" and not technicians, because the name "technicians" means on forums they are same as support mod where they help and fix problems. Is this finished and solved?